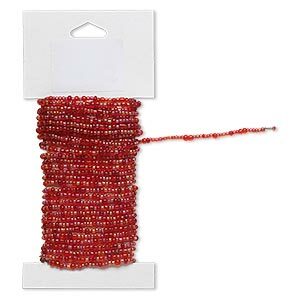 Beaded wire, glass and brass, transparent rainbow red, #9 and #6 round seed beads. Sold per 15-foot card with hanging tab. Item Number: H20-8071GL Have a question about this item? 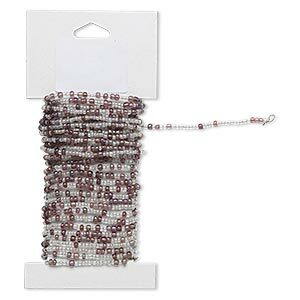 Make multi-strand jewelry in minutes! 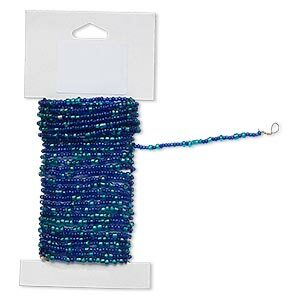 Pre-strung glass seed beads in 15-foot packages of fabulous colors in complementary combinations. 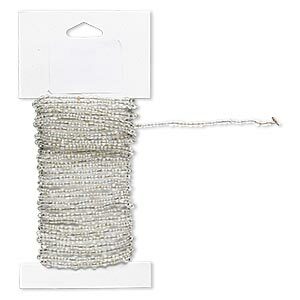 Approximately 28-gauge brass wire holds its shape and can be wrapped around multi-strands to secure in place without a clasp for bracelets or coiled together for rings. 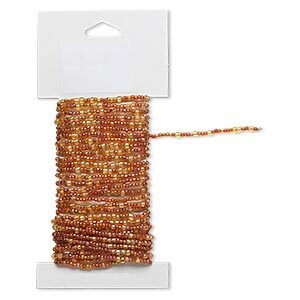 Beaded wire, glass and brass, transparent rainbow gold and orange, #9 and #6 round seed beads. Sold per 15-foot card with hanging tab. Beaded wire, glass and brass, transparent rainbow lavender and clear, #9 and #6 round seed beads. Sold per 15-foot card with hanging tab. Beaded wire, glass and brass, transparent rainbow clear, #9 and #6 round seed beads. Sold per 15-foot card with hanging tab. 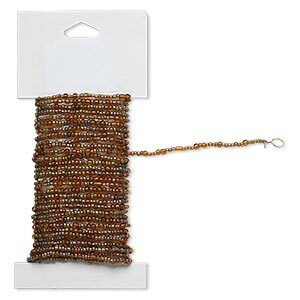 Beaded wire, glass and brass, transparent rainbow brown, #9 and #6 round seed beads. Sold per 15-foot card with hanging tab. 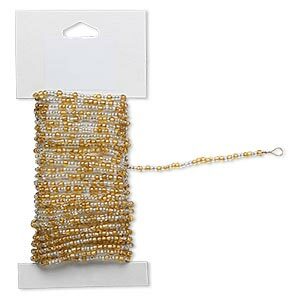 Beaded wire, glass and brass, silver-lined gold and clear, #9 and #6 round seed beads. Sold per 15-foot card with hanging tab. 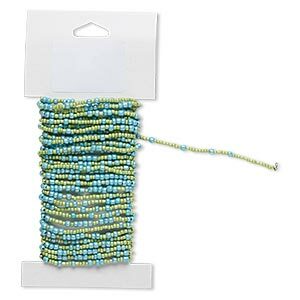 Beaded wire, glass and brass, opaque luster turquoise light green, #9 and #6 round seed beads. Sold per 15-foot card with hanging tab. 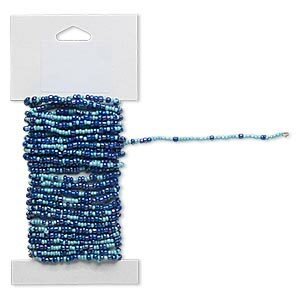 Beaded wire, glass and brass, silver-lined teal green and blue, #9 and #6 round seed beads. Sold per 15-foot card with hanging tab. 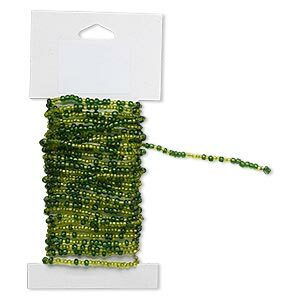 Beaded wire, glass and brass, silver-lined green and light green, #9 and #6 round seed beads. Sold per 15-foot card with hanging tab. Beaded wire, glass and brass, opaque luster rainbow turquoise and blue, #9 and #6 round seed beads. Sold per 15-foot card with hanging tab. 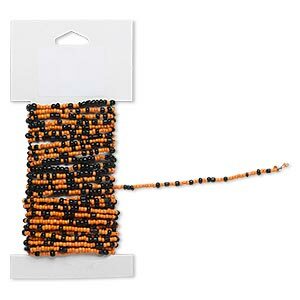 Beaded wire, glass and brass, opaque luster orange and black #9 and #6 round seed beads. Sold per 15-foot card with hanging tab.